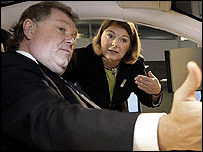 CBI director-general Digby Jones has been knighted after five years at the helm of the business leaders' group. Mr Jones said the honour was a measure of how well business was regarded in Britain. The 49-year-old said the CBI worked hard to improve workers' lives as well as help the economy. He is an advocate of improving skills and training in the UK workforce, and has forged a good relationship with Chancellor Gordon Brown. His non-stop, enthusiastic style of leadership has seen him raise the profile of the CBI. He also visits businesspeople in different parts of the country every week to discover what are the most important issues for them. "I like to think the voice of business has become more understood under my leadership, but this has been a team effort and I am delighted for everyone at the CBI. "I have given the organisation back to its members as well as pushing issues I feel passionate about such as training and skills." The CBI has attempted to build bridges with the Labour government, and built a stronger voice overseas. It has a new office in Washington, a bigger presence in Brussels and plans for a new office in China. "Politicians of all parties listen to us now and I feel very proud and thrilled today at this honour," he said. He has had run-ins with trade unions: as recently as September his claim that they were "increasingly irrelevant" had one union telling him to "join the real world". Knighthoods also go to Toyota's UK chairman Alan Jones; Office of Fair Trading chief executive John Vickers; Professor Clive Granger, the Nobel prize winning economist, and the former NatWest chief executive Derek Wanless, who went on to conduct two government reviews on the NHS. And leading British computer games maker Peter Molyneux, head of Lionhead Studios, has been made an OBE for services to the computer games industry. The man behind the automatic cash machine has also been honoured by the Queen. John Shepherd-Barron, 79, who installed the world's first ATM almost 40 years ago, has been awarded the title of OBE for services to banking. Peter Lederer, chairman of tourism support body VisitScotland, has been made a CBE for his services to the industry. The same honour goes to Susan Rice, chief executive of Lloyds TSB Scotland, for services to banking. Stuart Doughty, the chief executive of Costain Group, gets a CMG for services to international trade and investment. Sir Bryan Nicholson, chair of the Financial Reporting Council, receives a GBE.